Which Bad Dietary Advice Caused Obesity to Grow? Perhaps the backlash against decades of faulty low-fat dietary guidelines is peaking. It’s now popular to suggest that bad dietary advice in the 1980s sparked the epidemic of obesity that’s still booming today. But like so many other glib proclamations on the subject, this one is probably wrong. Or at the very least, it glosses over many other issues. Journalist Gary Taubes laid it out in the New York Times Magazine back in 2002. He called it a “find-yourself-standing-naked-in-Times-Square” nightmare. Advice to eat less fat and more carbs might actually be causing – not blunting – an epidemic of obesity. Recent research suggests that the focus on dietary fat reduction has directly contributed to this growing burden of chronic disease. In other words, the dual epidemic of obesity and diabetes comes from bad dietary advice to pursue a low-fat diet. So now, books on low-carb diets – including Ludwig’s – are selling quite well. Many folks are on this bandwagon. Taxing sugary foods and beverages is now a core strategy for battling the global scourge of obesity. It’s a magical answer. Stephan Guyenet has a gift for packaging provocative ideas into simple graphics. He pointed out in 2015 that obesity kept going up, even after a decade of declining sugar consumption. Now he’s pushing a bit harder on some of the flawed thinking that’s so popular. To make his point, he’s constructed the opposite – and equally flawed – argument. Maybe low-carb dogma is making things worse! Advice to eat less sugar and refined carb is a good thing. What I object to is the hot air that comes along with it. Click here for further perspective from Jerome Groopman in the New Yorker. 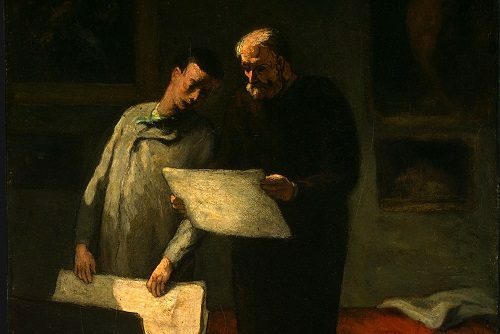 For Guyenet’s blog, click here. 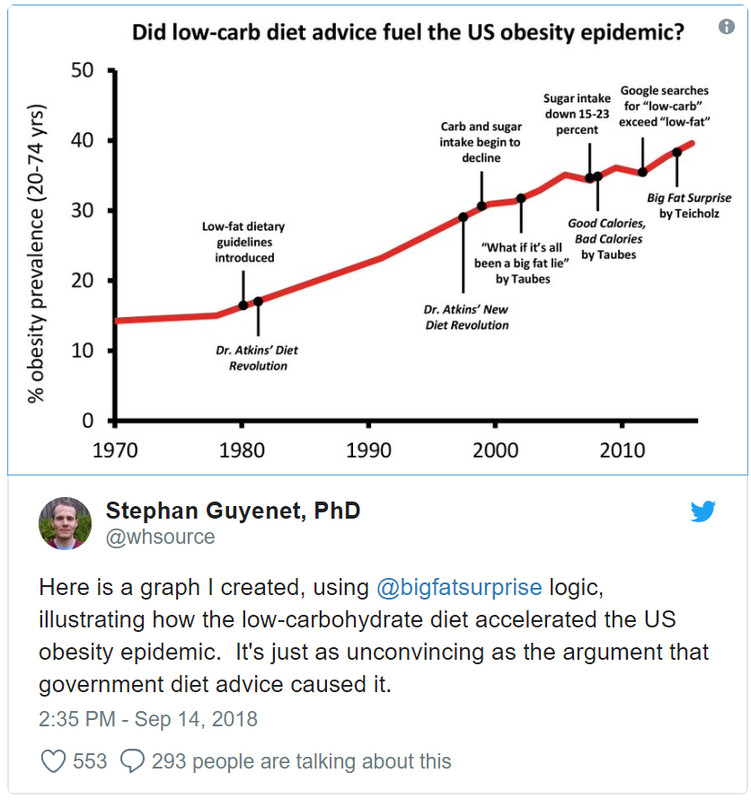 It is remarkable how partisan nutritional arguments are, this article has a clear agenda in mind, to claim that low-fat diet advise has similar correlation with obesity trends as the low carb advise. To the independent thinker, this is clearly a problematic argument. it needs a careful examination of rates of progression of obesity to make such a claim. There are reports showing recent leveling off of obesity rates in some states. In any case, we should promote arguments promoting partisan agenda without sound evidence behind it. The only animal on earth that intentionally tries to make itself smaller is the one in the mirror that looks back at your each morning . Simply put this animal favors surplussing calories and resists deficiting them. This animal can surplus calories with fast or slow food that contains fat, or protein or carbohydrates. We all wish is wasn’t so. Unfortunately I suspect that those that religiously followed the low carb diet did lose weight or stayed at normal weight BUT I also suspect that those who also drank a lot of sugar sweetened beverages consumed by default a lot of fructose . Fructose when consumed in excess and processed in the liver has a lot of harmful effects—- high de novo saturated fats, elevated LDL cholesterol, fatty liver , high uric acid levels, — all associated with insulin resistance and increased weight . Please remember that when one is on a low fat diet by default he/she will consume more carbohydrate calories . Studies as far back as 1961 reported a steady upward trend in consumption of refined oils as rates of obesity began to rise in the United States — a change which now appears far more dramatic and significant than any increases in consumption of sugars. Dietary advice was aimed at reducing saturated fats while refined oils were called “healthy.” So I’m among those who blame the low-fat scam on our ever-increasing rates of obesity and associated diseases, not because of sugar but because the wrong fats were targeted. And that, of course, is strictly about profit.